Home > Animals, Jellyfish, Nature, Seascapes, Wildlife	> Through the Roof. 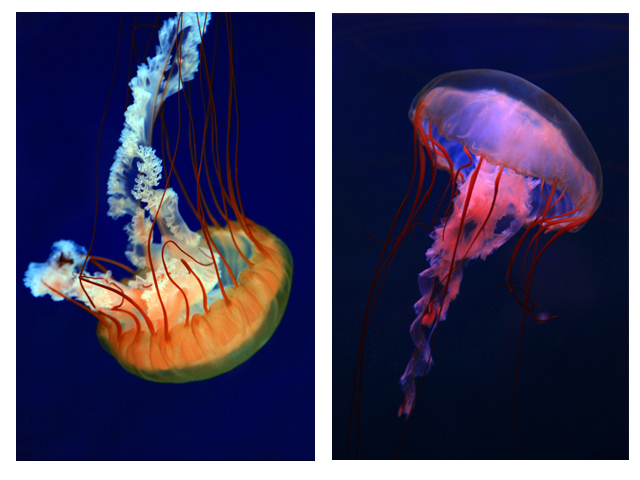 Due to popular response, as mentioned below, here are a couple more jellyfish images from the series: FLOW. “Split” has been exhbited in Galleries in Denver and Ft. Lauderdale, featured in COLOR magazine and as PDN’s Photo of the Day. Starting with the next post, I will go back to mixing it up with images from various Portfolios to keep things fresh. Almost as much as creating my images, I enjoy showing them. When I started this Blog a couple of months ago, my goal was to share my work with as many people as possible. Slowly, but surely, visitors came and thankfully, my readership has been steadily increasing. Then, this past Friday morning, the great people at WordPress (www.automattic.com) featured Adventures From Behind the Glass on their “Freshly Pressed” page, chosen from some 365,579 bloggers that day. As it happens, I was off-line Friday until about 6 pm when I turned on my laptop to check the Blog and realized the visitor count had gone ballistic. Eventually, it became apparent that I had been Freshly Pressed and the response was overwhelming. Between FP and a subsequent nod from www.notcot.org I have been fortunate to have more than 6,000 visitors view my work in the last 3 days. (Not bad for a guy who believes that “winning” is being lucky enough to have one goddess in your life). So, thank you to the WordPress.com staff for the great exposure. I have also received assistance from many people that have helped me exhibit my photography to those that wish to see it. My Blog Roll consists of knowledgeable and influential people in the photographic industry, many of whom I have crossed paths with and from each I have learned something. I have had the privilege of exhibiting in many of the Galleries and being published in many of the Publications listed. In addition to the other terrific people I have worked with on the list, extraordinary editor Paula Gillen (www.gillenedits.com) has, for some time now, helped me make the tough decisions as to which of my images to showcase and when. Finally, social media dynamo Allison Zavos of Featureshoot (www.featureshoot.com) has been instrumental in helping me build and expose this Blog, the readership of which has now, gratefully, gone…through the roof. Switching gears. Go with the Flow.